It is important for a carer to recognise they are part of a support team. That team is centred on the person who requires care, in partnership with the primary carer, and further supported by family, health care professionals, low vision services, support groups and other community services. A carer is never alone in providing assistance to the person they care for. A carer is part of an extended support team. An ophthalmologist is a medical doctor who has completed extra training in eyes. Ophthalmologists perform eye exams, treat disease, prescribe medication and perform surgery. They may also write prescriptions for spectacles and contact lenses. Some ophthalmologists have further specialisation as a retinal specialist. An optometrist performs eye exams for both vision and health problems, prescribes spectacles and fits contact lenses. Some optometrists have further specialisation in low vision rehabilitation. They can diagnose eye diseases and refer patients to ophthalmologists for treatment. For people with low vision, the optometrist can provide practical advice on how to maintain quality of life and independence. An orthoptist is an allied health professional who assists in the diagnosis and treatment of vision problems. An orthoptist may work in an ophthalmologist’s surgery, a hospital/community eye clinic or in a rehabilitation setting. Rehabilitation is essential for supporting independence and quality of life. The following professionals can help to teach new skills to people who have low vision for ongoing independence and confidence in everyday activities. An occupational therapist (OT) is a health professional who assists people with vision impairment perform practical everyday tasks by providing them with the skills and strategies to maintain their quality of life. Occupational therapists show people with low vision how they can make the most of their remaining vision as well as using other senses like touch, hearing and smell to perform daily activities. This may include everyday tasks such as cooking, personal care, housework, making a cup of tea or using the telephone. Orientation and mobility instructors help a person with low vision to move about independently, confidently and safely. A mobility instructor can visit a person’s home and give advice and training regarding common challenges such as stairs, public transport, crossing roads and finding the way to different places. Find low vision service providers. 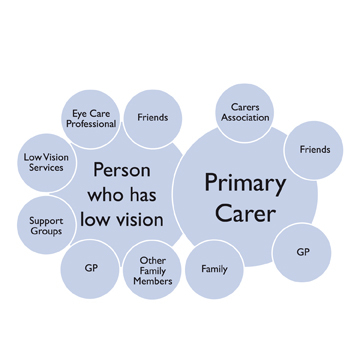 A carer can assist a person who has low vision to access the right services and aids by contacting a local low vision agency and requesting information on the best course of action to follow. One of the most important services that blindness and low vision agencies offer is a low vision assessment. This assessment will help determine the amount of vision remaining and how to make the most of that vision. Some blindness and low vision agencies also provide low vision aids and adaptive technology. This equipment can help a person who has low vision maintain quality of life and independence. In every State and Territory of Australia there is a carers association which oversees all of the services and support available to carers. Depending on the State or Territory, the carers association can connect carers to services such as counselling, respite care, information and advice. These services are all designed to help carers in their care giving role. Find the details you need to contact a carers association.